Today's guest post is by David Fictum of Colonies, Ships, and Pirates. David is engaging in a new, exciting project exploring common sailor's clothing in the late seventeenth and early eighteenth centuries. If you're interested in what the slop clothes of my era of study evolved from, I encourage you to support David Fictum's research. 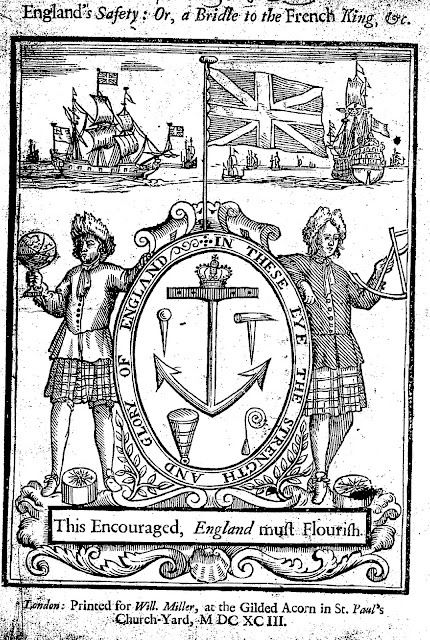 Frontispiece to England's Safety, 1693. Maritime clothing in the Age of Sail is a topic that only receives minimal attention in the greater history of the maritime world. For those interested in the attire of mariners during the latter half of the eighteenth and early nineteenth centuries, learning about sailor’s garb in the time preceding that period brings further context and understanding to the latter period. In 2015, I completed and successfully defended my master’s thesis for the Maritime Studies Department at East Carolina University concerning the attire of common sailors and pirates for the late seventeenth and early eighteenth centuries. However, before I take my thesis to a publisher, I need to conduct more research so I can provide my readers the best work possible. To conduct said research, I need to go to the archives in London for a 3-week research trip. I cannot raise the funds to conduct this trip by myself, a problem I had when I originally worked on my thesis. Therefore, I have established a GoFundMe page and am asking for donations to help fund this research trip. I used a variety of period documents to study the mariners and pirates of this era. My research used publications from the era, newspaper accounts, Admiralty contracts with slop sellers, Navy regulations, and probate inventories. It is this last type of source that I wish to use collect more of for my studies. I managed to obtain over a dozen relevant probates through published accounts and the help of Dr. Ed Fox. All the information I collected allowed me to gain not only a better idea of what they wore, but what said clothing said about the lives and world of the sailor. They allowed me a good qualitative, but not quantitative, perspective on maritime clothing. My visit to London, specifically to the National Archives, would allow be to access and photograph hundreds of probate inventories of sailors that died at sea. These particular probates offer the best chance at seeing specifically what clothing sailors owned while at sea in a quantitative manner. In addition to probates, I will look into other period manuscripts and documents, including many more documents from the Admiralty. Once I complete my work at the archives, I will use the data to improve my thesis and create a two-volume work. The first volume would be my main text discussing maritime clothing, while the second volume would contain many transcripts of the documents I used in my research, including those I obtained during the research trip. The latter volume will provide broader access to documents previously accessed by a small number of historians. This work overall would help establish a foundation on this subject that others in the future can build on in later years. For those of you interested in this topic, or in maritime history, or in clothing history, or the history of the greater Age of Sail and Early Modern Era, I encourage you to donate to my GoFundMe page and to pass on links to my page to others who also might be interested.